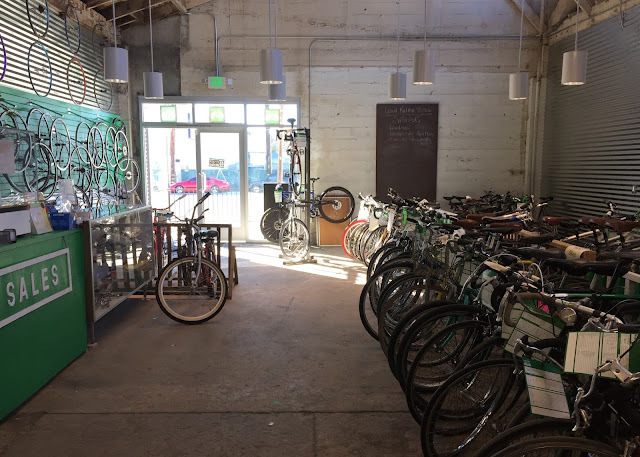 Note: a special shout-out to all who volunteer, and to Garvin Thomas of NBC Bay Area who came out this past Saturday to cover the Great Bike Migration of 2015/Good Karma Bikes moving to 460 Lincoln Avenue. You can watch his Bay Area Proud story here and follow Garvin on Twitter. Thanks again for coming, Garvin! So as I mentioned earlier this week I borrowed the signature cargo bike from Box Bike Collective (and wondered: how do we want our children to see the world?). It’s the first time I’ve ever ridden a long cargo bike with the linkage steering so I was excited to try it. I’ve long ago been sold on the concept of using a bike instead of a second car (or even a first). 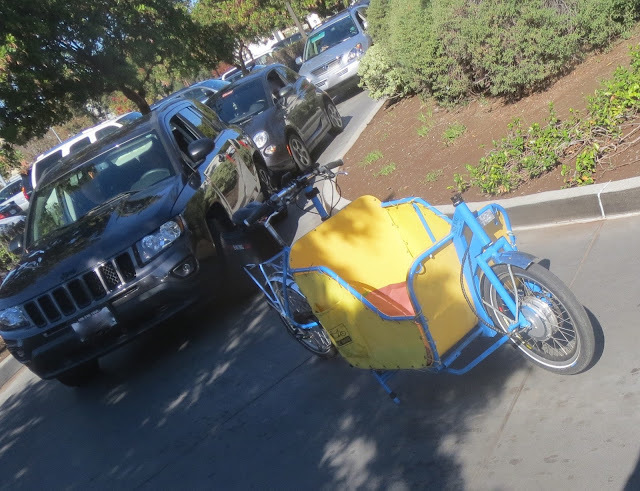 Honestly, car traffic in Silicon Valley is so bad I don’t understand why I don’t run into dozens of Box Bikes on the 11-mile ride to Good Karma Bikes at 460 Lincoln Avenue. But a review coming through the lens of someone who already loves to bike isn't going to carry a lot of weight with the intended target of this product: motorists. 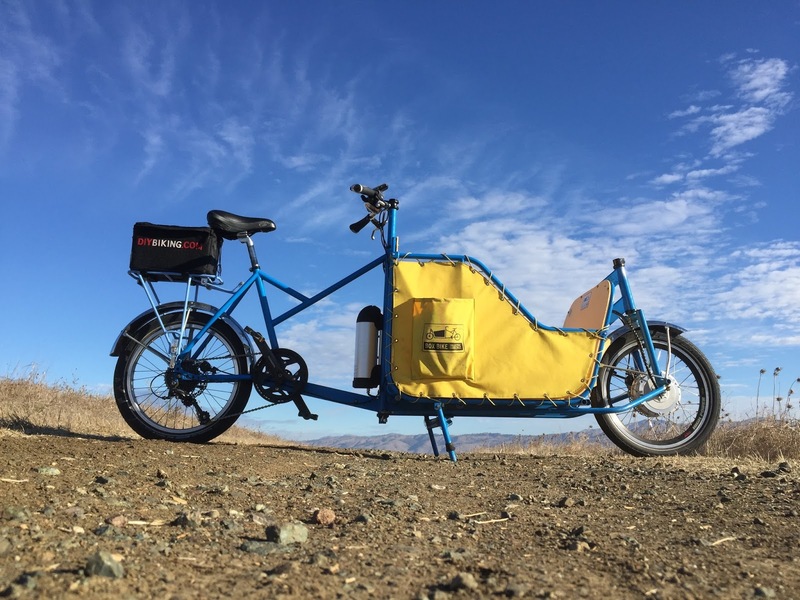 To that end, I’m going to write this review based on questions I think California drivers might have since I'm sure they want to know if they can do all the things they are used to doing in a car with a Box Bike. Can I go to a home improvement stores and buy what I want? 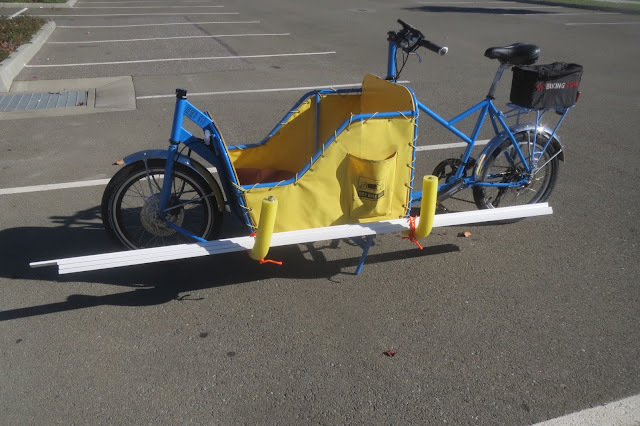 I’ve already explained with the Bikeducken that yes, a cargo bike can carry lumber. I didn’t need to buy an entire sheet of plywood to build a workbench, but I did need molding for an interior door in my garage. So I went to Lowe's, locked the bike up, and bought four seven-foot pieces of wood. The removable aluminum racks - known to carry large stepladders and surfboards - fit and lock in spaces on either side of the bike, and I pedaled home with confidence. 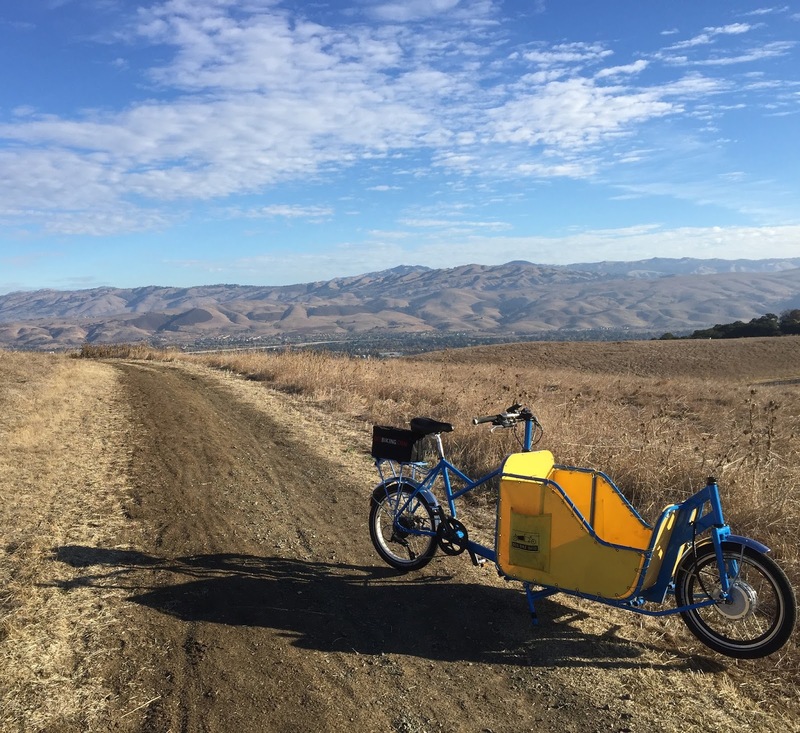 As you’d expect, a bike this long doesn’t turn on a dime but the steering is surprisingly sensitive: After the first few miles of riding the Box Bike I found the handlebars would cooperate perfectly well with a gentle nudge. Lumber will get home with ease - and no straining to tie it to the roof of your car. Can I go to the grocery store to buy bottled water? The short answer is, of course, yes. 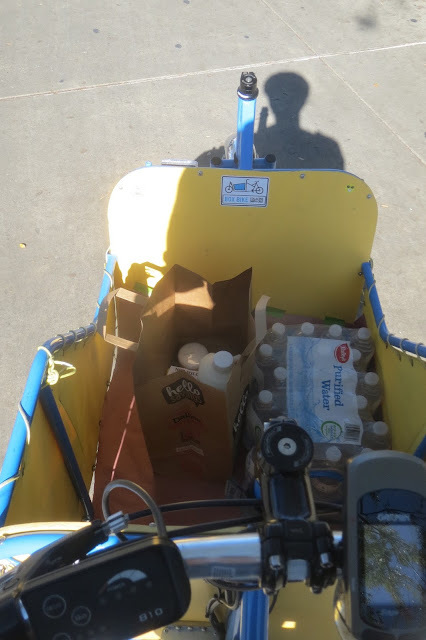 But having a cargo bike does change your shopping habits. At Nob Hill Foods, while paying for my groceries, I had an unexpected impulse to rent the Rug Doctor. My living room carpet hasn’t been cleaned since I moved here from Connecticut and I knew I had the cargo space. 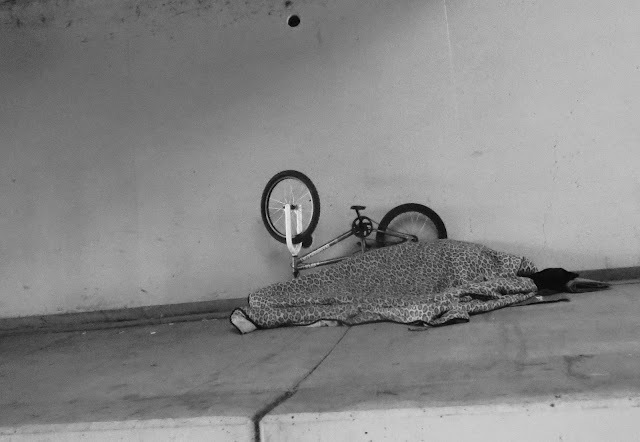 Spontaneously renting a carpet cleaning device just isn’t an urge I have when I go buy eggs on the fixie. Can I still race up to a red light even though I have to slam on my brakes and wait for it to change when I get there? A bit of background here: I’ve found California drivers are mostly much more polite than drivers in Connecticut or New York. 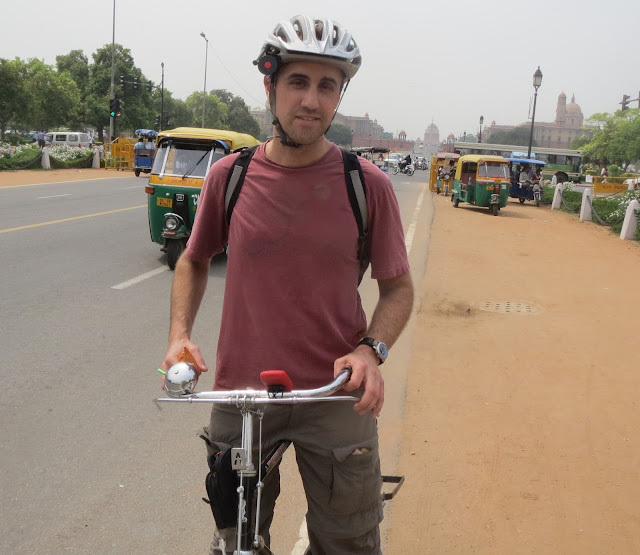 The biggest downside is there are a lot of them and many - more than any other drivers I’ve encountered in my life - tend to race up to a traffic light as though the cars are children and the red light is the teacher about to tell a story. 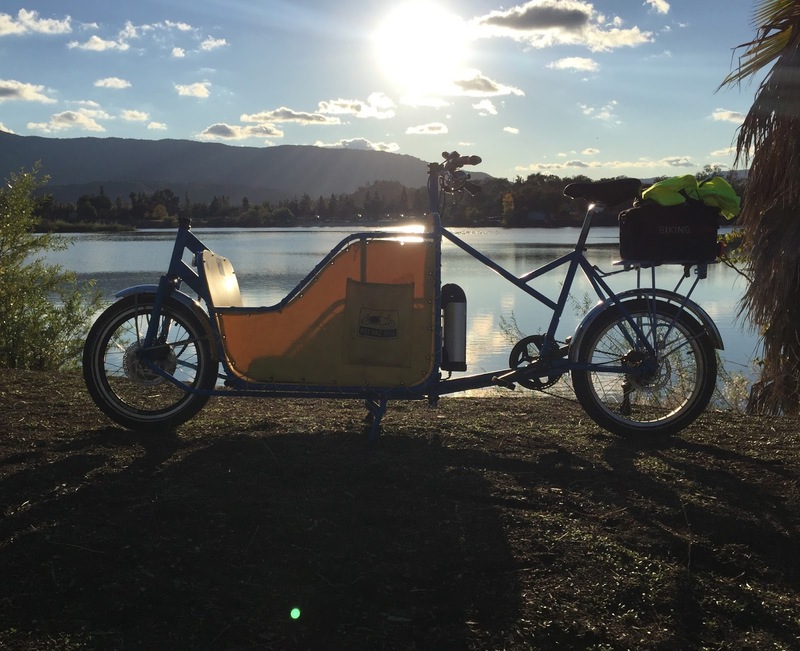 This is where the electric assist of the Box Bike comes in. It has three modes (low, medium and high) and you can reach the control without taking your hands off the handlebar. 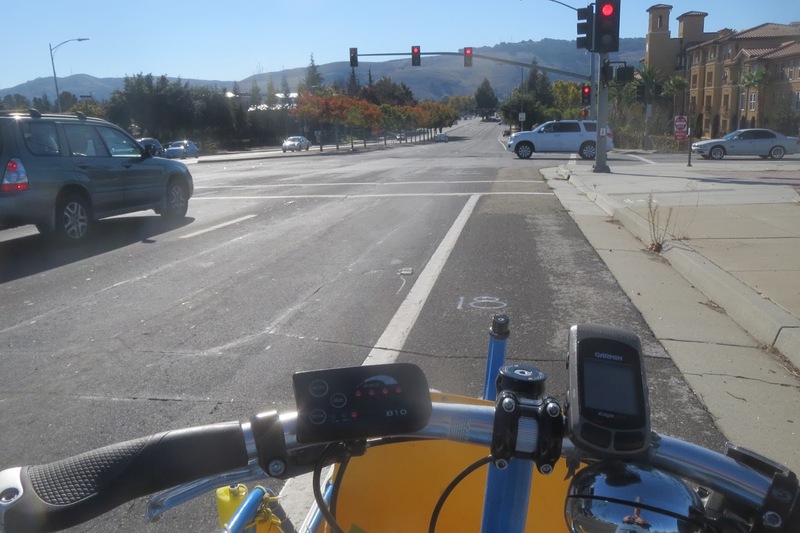 This means if you’re approaching a red light, you can hit the control button with you thumb, put the electric assist on high, and zip up to a traffic control technology over 100 years old. 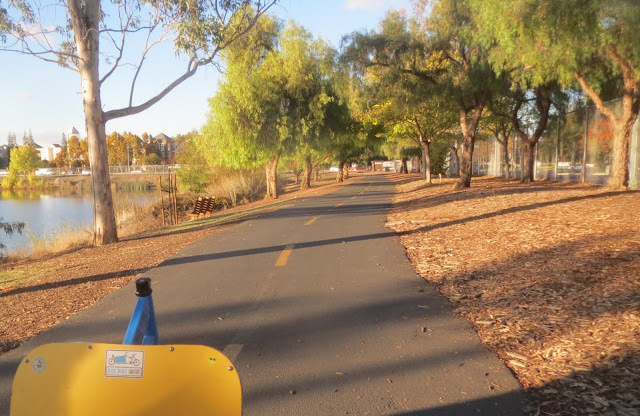 (In case you’re wondering, this bike does have a ‘throttle only’ button but it only moves the bike at about walking speed so it’s meant for helping you get up to speed from a dead stop or help you move a loaded bike while walking it). But back to the red light: when you get there, you can hit the disc brakes by gripping the handles. The brakes on the Box Bike are great but I did wish for regenerative braking that would charge the battery while slowing down (as some electric assist systems have). Now if this is the first electric assist bike you’ve ever ridden you may complain about the wildly inaccurate battery gauge. This is normal. Both the complaining and the wildly inaccurate battery gauge that seems to come with every e-bike I've ever reviewed. Total range and battery consumption will vary - I got to Good Karma Bikes at 460 Lincoln Avenue in San Jose and back again (about 22 miles round trip) being sensible with the battery, so chances are it’ll handle your commute. Not only that, but on this morning’s trip w/a 38 pound load I had the electric assist system off for five miles and didn’t mind at all. Can I pick up a pizza? 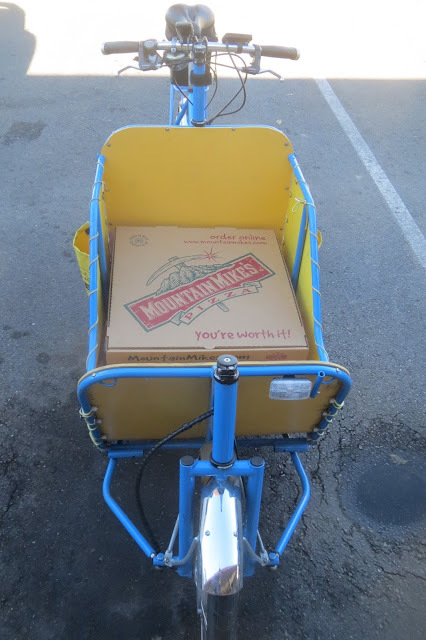 Mountain Mike’s largest pizza is 20” in diameter and the box couldn’t fit better in the cargo hold. The pizza is protected, doesn’t move much, and will get home quickly. It’s also kinda shielded from the wind, so it’ll still be a good hot temperature. 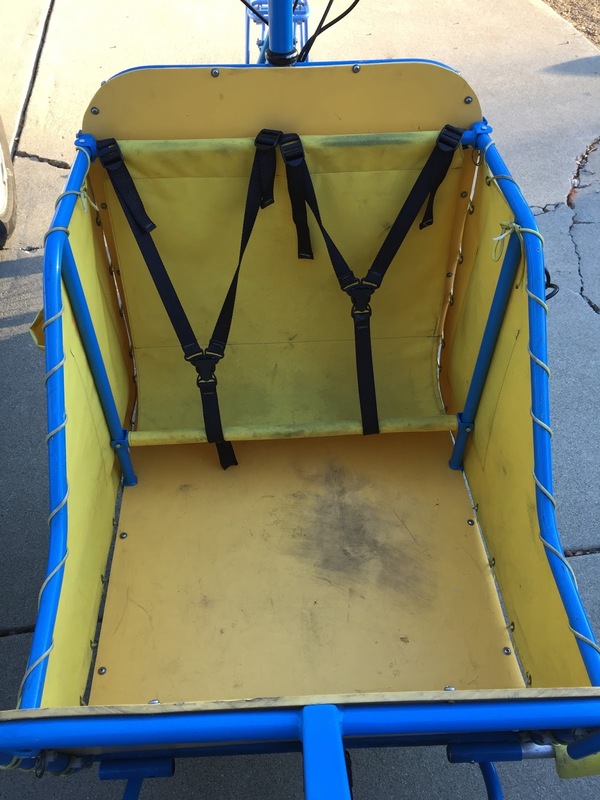 The depth of the cargo box means you can carry a lot of pizzas and even wings. 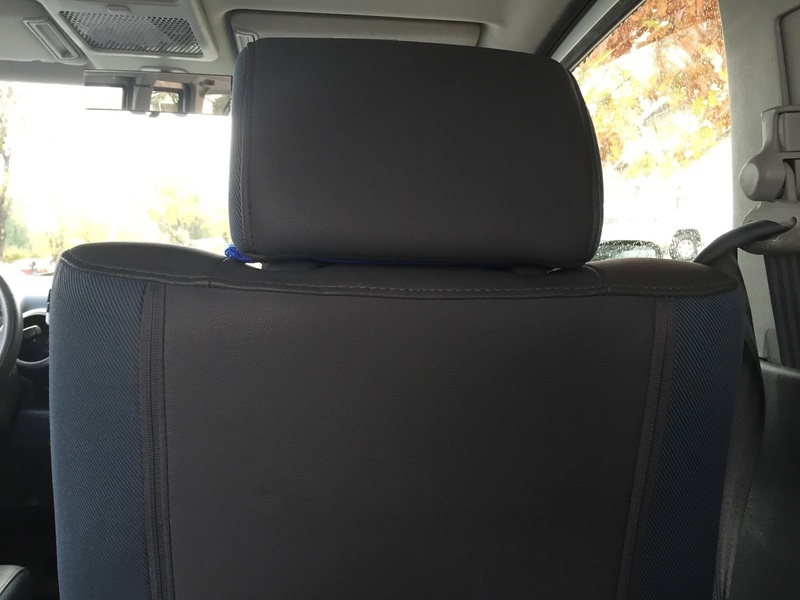 It's also almost impossible to reach the food and snag a slice while you're waiting at a red light. That's a good thing. You know, don't drive distracted. Can I carry my child in comfort? 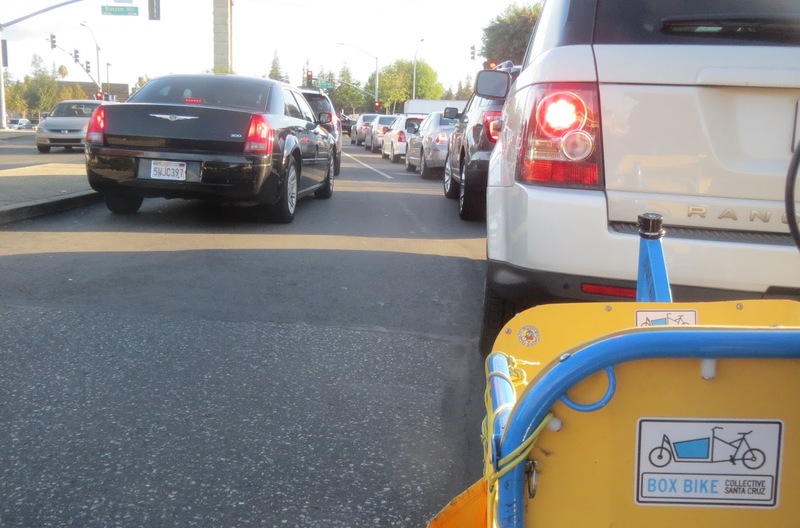 I covered how much better it is that a child has a nice view of the world instead of a view of a tablet/backrest of your Kia combo in my first post on the Box Bike. But I've also never seen an unhappy child riding in this style of bike. 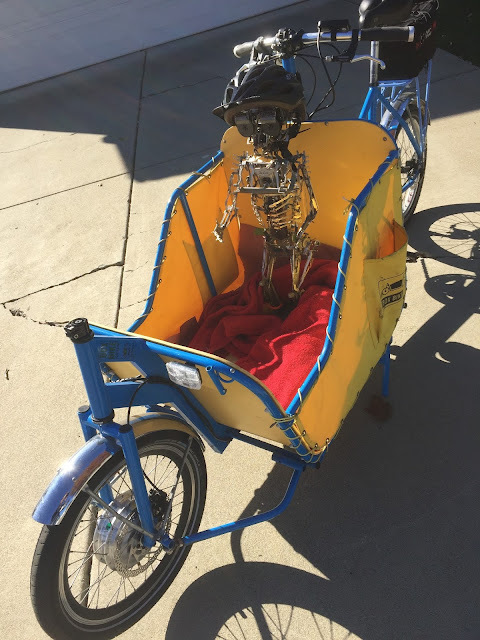 Since I didn’t have a child available I gave the sculpture I welded from a single vintage typewriter (called ‘Making a Friend at the Rowayton Arts Center show last year) a ride to the local school and back. The helmet rattled a bit over the bumps, but the 20” Schwalbe Big Apple tires handled the uneven pavement with ease and every weld held. If my sculpture holds together, so too should your child. Can I take it through the drive through window at the In-N-Out Burger? Being from New England, I only knew In-N-Out Burger existed because of the film Fletch Lives - the sequel to the major motion picture, Fletch. 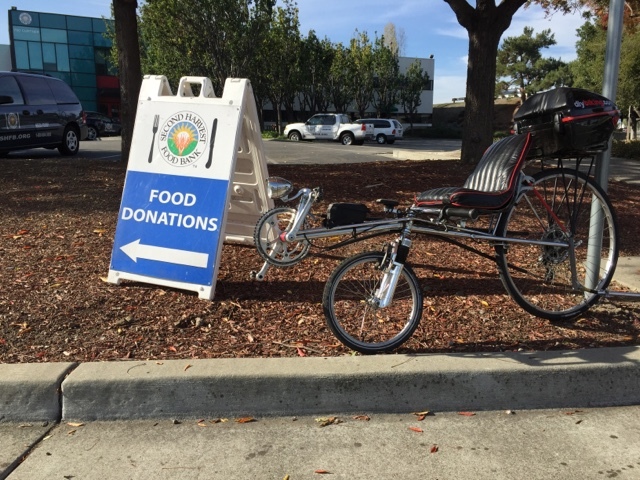 Then, the day after I got here, I began noticing them scattered around Silicon Valley. 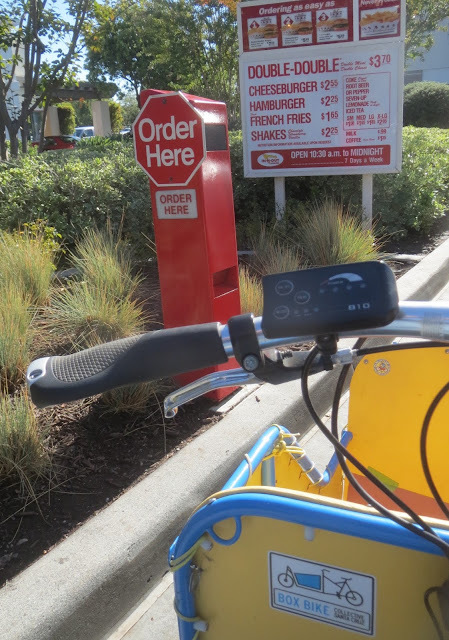 When biking by an In-N-Out I’d see mostly the ‘In’ part: namely, cars lined up at the drive through window. Wow, I thought. I guess this is a real thing. 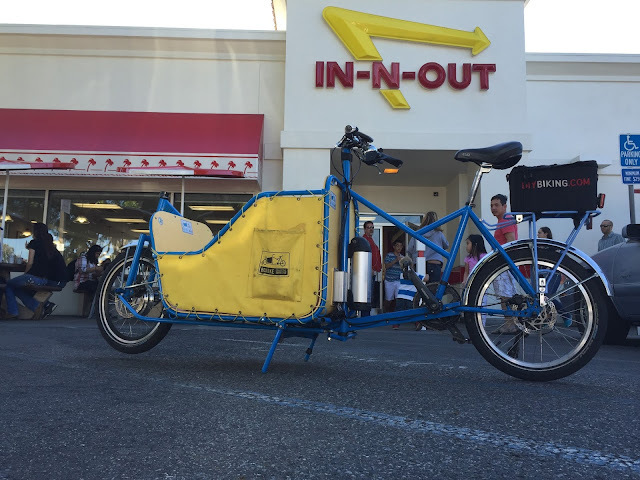 It made me assume that if one were riding a Box Bike and were turned away at the drive through of an In-N-Out that would be a deal breaker for a motorist reluctant to give up their car. So I decided to give it a try. Arriving at the closest In-N-Out around 12:20 yesterday afternoon, I was awestruck at the line of motor vehicles. The line - at least 15 cars long - was in the shape of the letter ‘P’: it started in the Kohl’s parking lot, turned right, led to the order window and turned sharply left to go to the exit. I positioned myself behind a white Toyota Camry and waited long enough to memorize the tag number. I have to tell you that you don’t really grasp how ridiculous drive through windows are until you’re waiting at one on a bike. 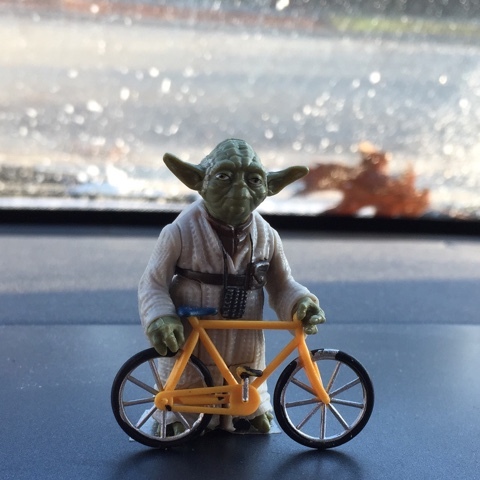 Maybe inside a car you fiddle with your smartphone, listen to the radio, text the person in the seat next to you - and so on, but when you’re on a bike all you see is what’s going on outside the car. I caught glances of people in their cars - who of course can't speak to one another because they are in cars - oblivious to how plain bizarre it is that their strictly emissions-regulated vehicles were pushing exhaust into the air for over 20 minutes waiting for a burger. 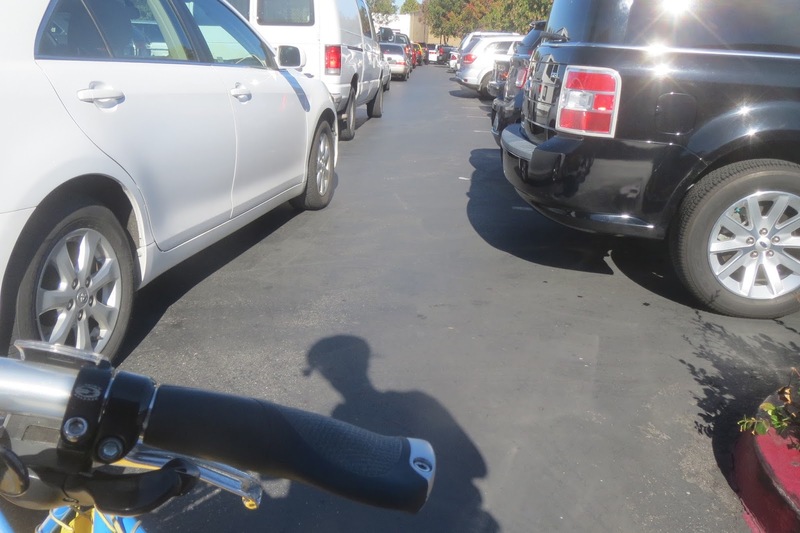 Because the line of cars stretched into the Kohl’s parking lot, I heard an occasional honk by a flustered shopper trying to get out of his or her parking space. Meanwhile the bike rack next to In-N-Out was nearly empty. In addition to wondering if I should have brought sunscreen, I began to wonder how special these burgers are. Were they formed by the hands of Nigella Lawson and served by Jennifer Beals? Seriously, what was the draw? I had to stay to find out. I wondered if I’d be turned away at the order window, but as it turned out a young man with a tablet was outside, walking to each car, taking the order. He greeted me professionally and I made my order: a cheeseburger and fries. After what felt like two seasons of ‘House of Cards’ later, a nice woman at the window took my money, and a few minutes after that I was served my food by yet another nice and professional In-N-Out burger employee who wasn’t a celebrity. 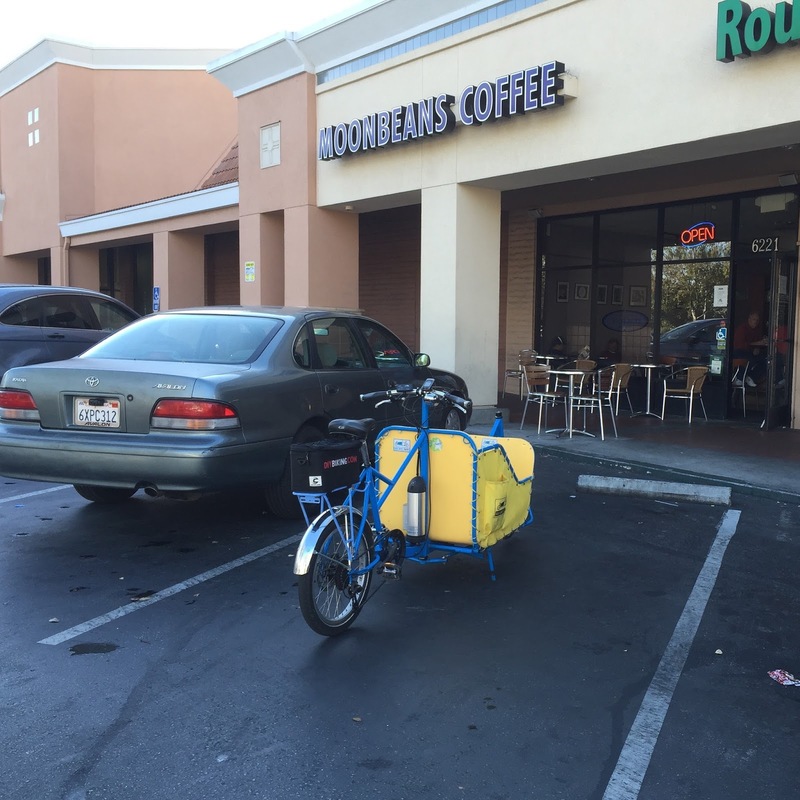 I put my food in the cargo box, pivoted the bike around to the right, and parked in an open space. In full view of the crawl of cars and trucks slouching through the line - and still hearing the occasional car horn of a Kohl’s shopper trying to leave - I ate the most overrated hamburger I have ever eaten. And the fries reminded me why I no longer eat fries regularly, so I only ate a few. 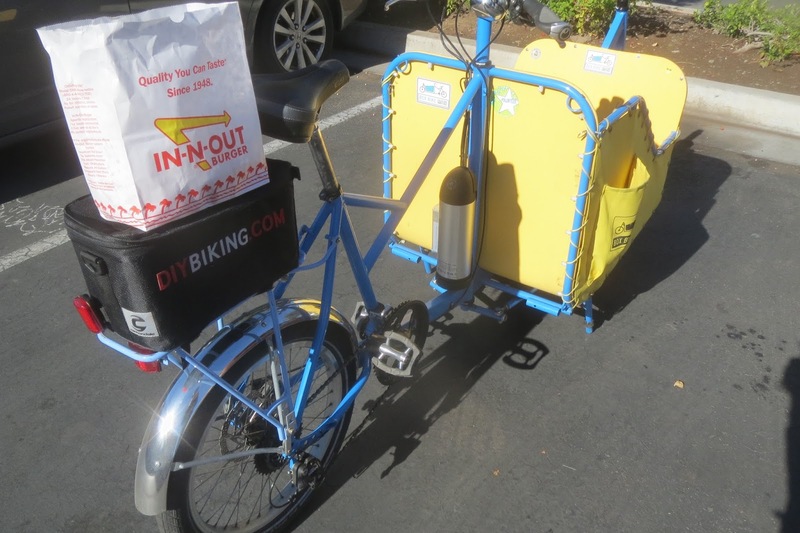 I fought an urge to scatter some fries in the cargo box and leave them there to give the bike a more authentic, car-like feel. 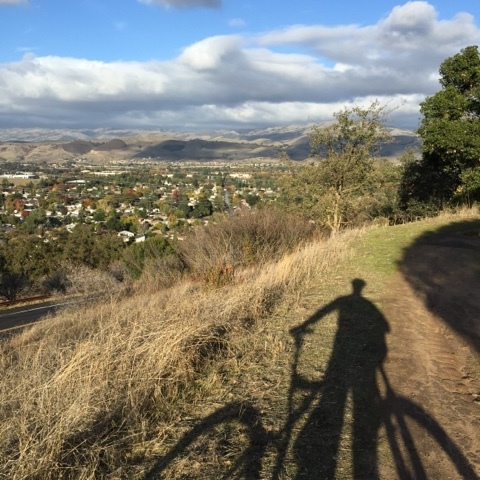 But the point is…I did it and so can you, California. You can use Box Bike for just about everything you use a car for. And $3,400 for a vehicle that can fit through a normal sized door, easily carried by two adults, and makes a better environmental statement than any Access OK bumper sticker, it is a fair price - I especially feel that way since I’ve spent almost one-third of that amount this year repairing my car before my Nine Morning trip from Connecticut to California, another one-third in the months since my arrival, and another third between the cost of gassing it up and the achingly expensive set of tires I bought last week. California drivers, if you’re still skeptical, if you still think you need to own a car, that’s fine. 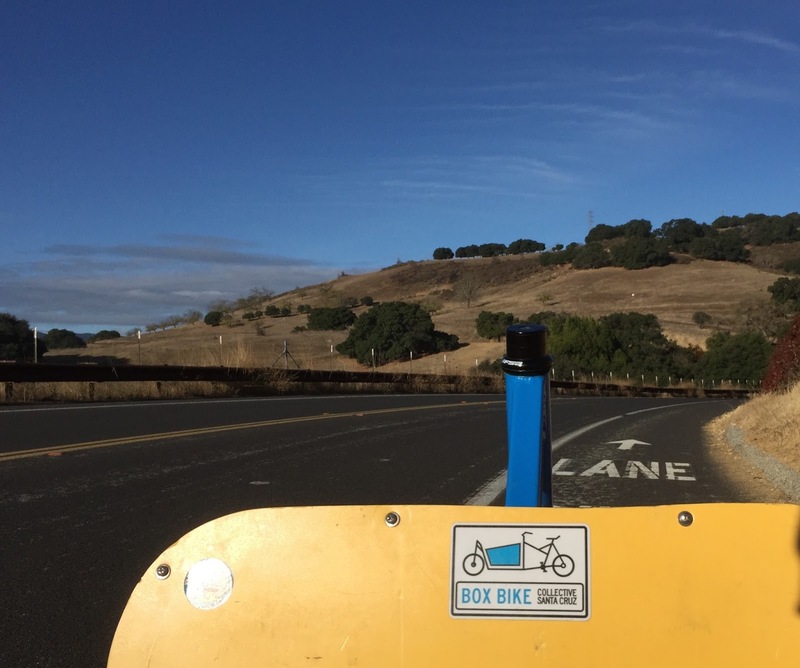 I own one too, but I’m sure that with a Box Bike you’ll do what this site has been calling for: using our cars less and riding our bikes more. Your car will last longer and, even more importantly, you’ll have more fun. 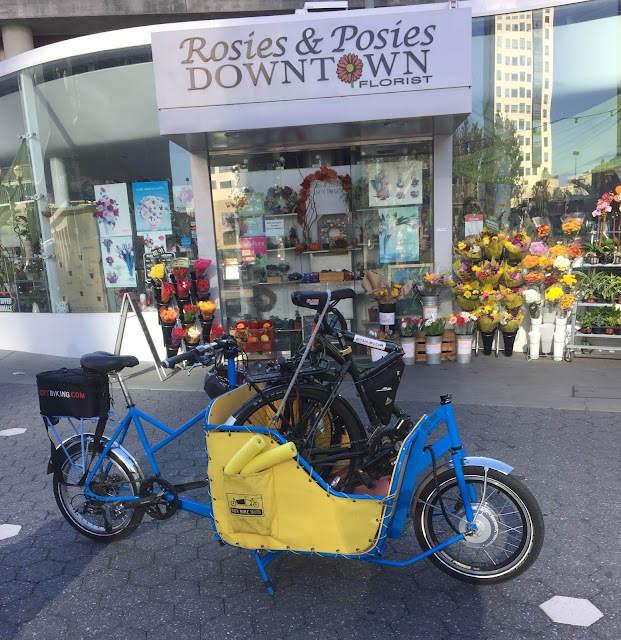 This morning I strapped my Dahon Matrix in the cargo box and easily pedaled to downtown San Jose to meet the bike’s next user: Cowgirl Bike Courier. 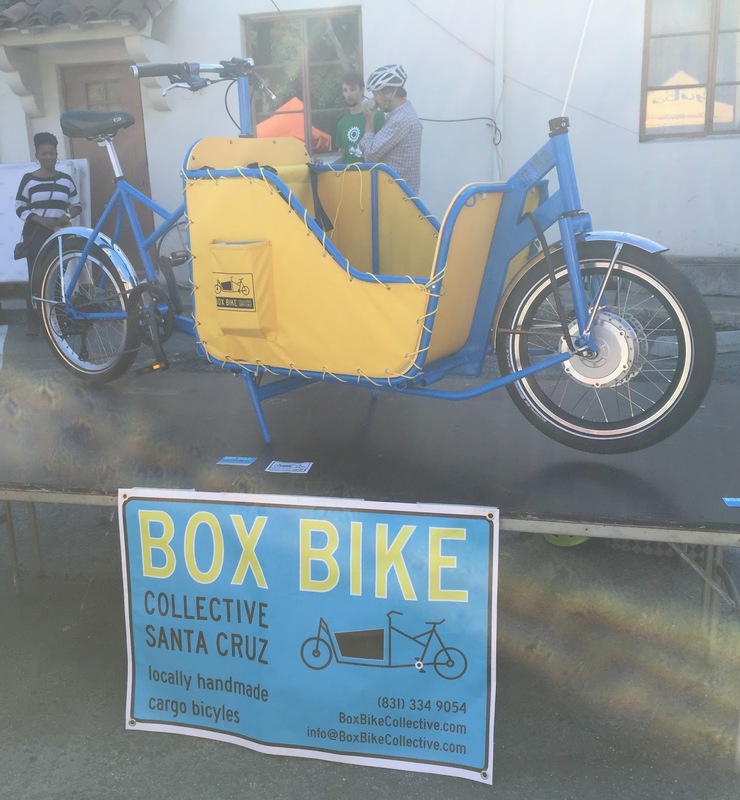 Look for it anywhere in their service area and check out Box Bike Collective so you can buy your own. 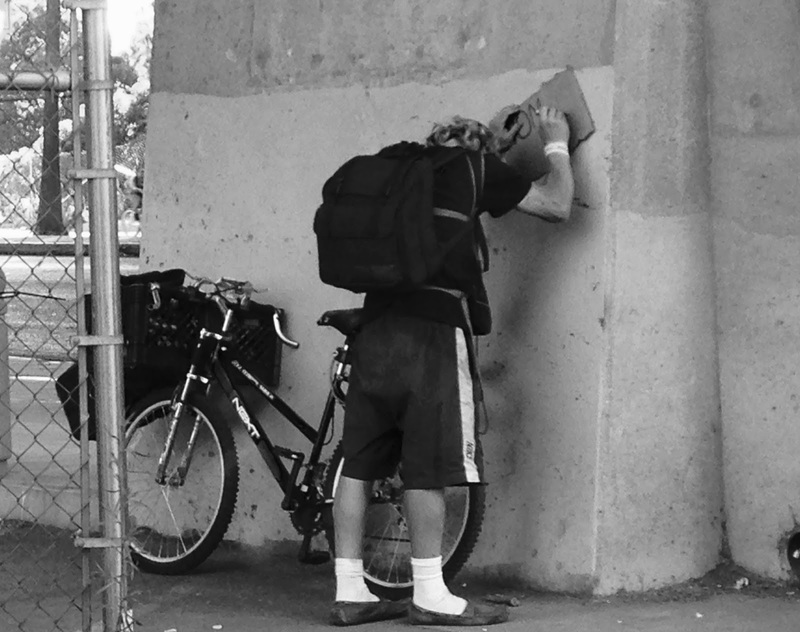 Thanks for reading and thanks for riding. 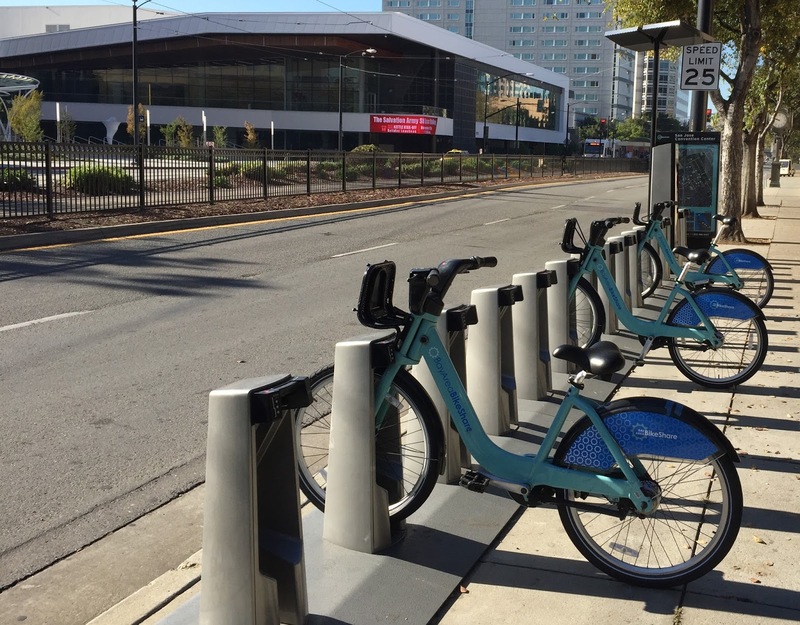 If you live in San Jose (or Silicon Valley, for that matter) this video is for you. Take a look and send to your Bay Area Friends. Thanks for watching and thanks for volunteering to help Good Karma Bikes move.